> "ngk spark plug boot"
this is a superior 6v high tension coil party for that spark in your life youve always been waiting for! comes with 2ft of the best 7mm hypalon plug wire, bosch style HT coil and genuine ngk boot hundreds of times better than your shoddy old plug boot. its such a basic important part of your ignition system why not go with a nice little upgrade!!! this is the CR2, it's 22 inches long and it's got the boot where you have to unscrew the little cap on the end of the spark plug. this is the CR4, it's 22 inches long and it's got the boot where the plug keeps it's cap. this is the CR5, it's about 42 inches long and it's got the boot where you have to unscrew the little cap on the end of the spark plug. this is the CR6, it's abot 42 inches long and it's got the boot where the plug keeps it's cap. build your own blue NGK boot! this is the LY11, it's about 23 inches long and it's got the 5K LZO5F maroonish red boot where you have to unscrew the little cap on the end of the spark plug. 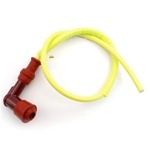 one of the most common types of moped spark plug boots!! 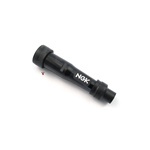 NGK spark plug resistor cover (5k).. rubber version! NGK spark plug resistor cover (5k).. long version! NGK spark plug resistor cover (10k).. short version!